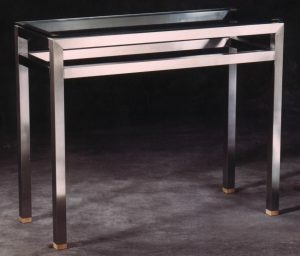 With the addition of, say, glass or some wood, stainless steel makes great furniture, both for restaurants and for the home. Tough, yet beautiful, it stands up to hard wear and tear, while remaining beautiful. How many of us can say that? 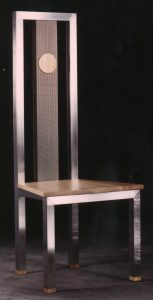 Pictured here is a chair, designed for a restaurant. Hard wearing, it will remain beautiful and easily cleaned, while providing sterling service in a busy commercial food serving business. 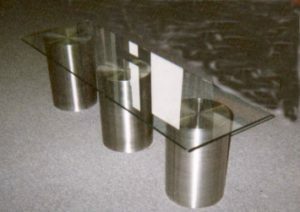 The next photograph is of a customised coffee table, comprising three stainless steel cylinders, topped with safety glass. 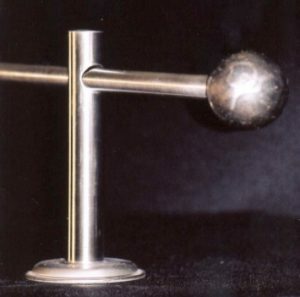 A simple, classic design redolent of the minimalist lifestyle so popular these days. Add a glass topped table to a set of stainless steel chairs and you have a clean, modern area for eating, whether in your own dining room or in a restaurant. The chairs can be produced as carvers (with arms), or without, or a mixture. 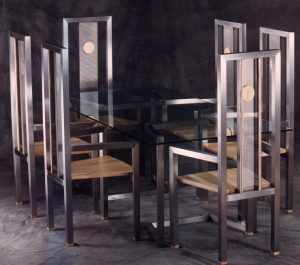 Tables can be produced at any height, for use as a telephone table, or a magazine disply unit, with a useful shelf below. From large items to small, stainless steel is equally happy with the mundane tasks of supporting your curtains, with that extra pzazz you want in your stylish home.